IMPS is an evolution of the highly successful project "MoldovaStamps", first developed by our President, Niall Murphy, in 2003 and developed continuously since then. MoldovaStamps succeeded in it's objective to be one of the best online single-country philatelic web sites in the world. It has enjoyed the support of people from over 160 countries and has earned a considerable reputation. MoldovaStamps is one of the most popular philatelic web sites in the world. In March 2018, it was decided to evolve MoldovaStamps into an international philatelic society, with the primary objective of promoting world-wide awareness of Moldova, her history and culture, through the medium of philately. 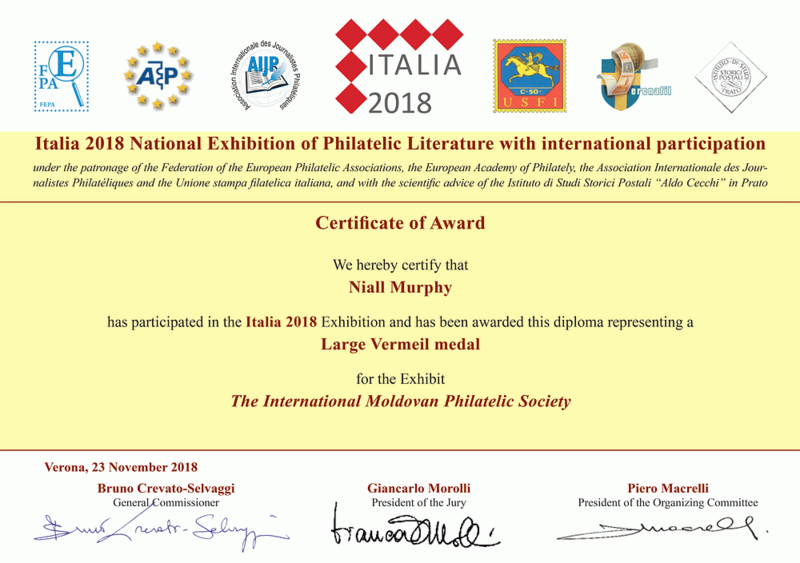 In the medium term, IMPS will form regional offices, on each continent, and gain membership of the American Philatelic Society (APS) and all the other regional federations in South America, Asia etc. IMPS will foster the best possible relations with the official postal operator in Moldova, Posta Moldovei, to watch over the production of postage stamps, ensuring that the best quality and most appropriate themes are produced.